When you take a class at The Village Potters, you get to share your creative exploration with diverse and interesting people. 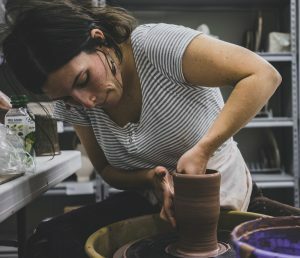 On Monday nights at The Village, in a class that is always full, you will find eight potters over their wheels working with focus and determination. They may have started a class with the goal to enrich their life, what they’ve found is that they are truly creative. They are potters. 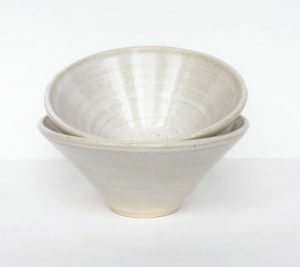 Hannah Barry is one of these potters. She has been studying with Judi Harwood for over nine months. I knew Hannah before she signed up for her first pottery class because by day, Hannah is the Director of Marketing for the prestigious Southern Highland Craft Guild. Judi Harwood and I have both been juried members of the Guild for decades and our Education Center at The Village has had an educational membership since 2012. Hannah has built a career working with and promoting the best craftsmen in the Southeast. Daily, she tells the stories of Master Craftsmen, shares the mission of The Guild and is surrounded by fine craft everyday. 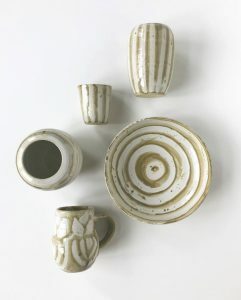 On Monday nights and during the weekend, Hannah is at the wheel throwing, studying form and making plans for her own studio and pots that she will one day sell. Her plan is to enter our Advanced Studies program and become a master craftsmen herself. I have no doubt she will do it, because she is smart, talented, tenacious, and she loves her life. Hannah has found her own creative path and a great group of like minded friends. At the end of class, before they head home to face the rest of a busy week, you might find Hannah and these wonderful studio mates walking next door to The Wedge, drinking a beer together, laughing, and talking about pots.